One story that people in the Bitcoin community have heard far too often is the story of a Bitcoin mining hardware company dealing with shipping delays. Butterfly Labs has been the most widely-cited example of a mining hardware company that cannot deliver on its promises, and it seems that Black Arrow is now the latest ASIC manufacturer to fail behind on their commitments. Customer complaints have continued to grow as we continue to get further and further away from the original promises shipping dates from this company. The company is now more than four months behind on orders from their paying customers. This kind of delay is definitely something that hurts the Bitcoin mining industry as a whole. The main question that people ask themselves whenever this kind of situation arises is whether the company is evil or just incompetent. In the case of Black Arrow, it seems that they may have just bitten off more than they could chew in the form of ASIC hardware orders. The main reason that hardware delays are so damaging in the Bitcoin mining space is that the failures to deliver on time actually hurts the customers overall investment. The Bitcoin difficulty tends to rise over time, which means more mining power is needed to recoup the costs of purchasing the mining hardware in the first place. Black Arrow has stated they are willing to provide refunds for customers who want them, but we’ll have to wait and see what happens in this classic example of a Bitcoin mining hardware manufacturer saga. BitFury, a major manufacturer of Bitcoin mining hardware, has decided that they want to enter the cloud mining space after receiving $20 million in venture funding. BitFury is one of the few mining companies that has been able to keep up a solid reputation during their time in the industry, and their move to cloud mining should come as no surprise. Many new companies are popping up in the area of cloud mining due to the large amount of success achieved in the space by CEX.IO. BitFury understands that mining is becoming about more than just selling the best ASICs, and it will be interesting to see how they can compete in the burgeoning Bitcoin cloud mining marketplace. Bitcoin mining is definitely booming in China, and the process of mining cryptocurrencies seems to be even more popular than using them for day-to-day transactions in the Far East. The T-110, a new miner from BitCrane, is hitting the market, and it is estimated to have a hashing power of around 1.1 TH/s. This unit actually combines two chips that are able to produce 550 GH/s each. In addition to the released hashing power statistics, the T-110 is also expected to use roughly 1100W of power. While keeping up with the latest changes in the Bitcoin mining hardware scene can offer some interesting info, the reality is that CEX.IO is still the most practical option for anyone who wants to start mining bitcoins today. You don’t need to worry about hardware delays when you purchase GHS because the cloud mining assets are immediately transferred to your own account after they’ve been purchased on the CEX.IO platform. Once purchased, the GHS will immediately start generating bitcoins for you through the GHash.IO mining pool. Perhaps the best part of this entire process is that you get to sell back the GHS whenever you’re ready to leave the market. 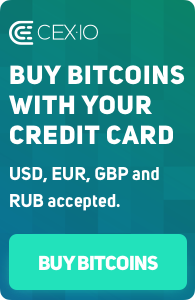 It’s hard to believe that CEX.IO has been able to make Bitcoin mining this simple.